What are partners? How do we define campaigns? What's a project? A Partner in SEOReseller.com is you - a powerhouse agency or a would-be powerhouse agency. By buying products from us, using our services or subscribing to our apps, we are forming a partnership to serve your clients better and easier. A Campaign is equivalent to one business that you are servicing or a single location for a multi-location business. 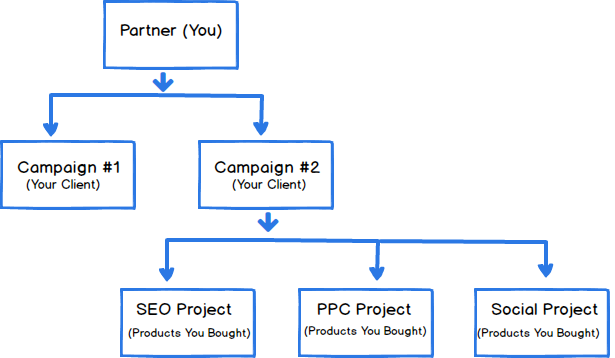 For most partners this means that a campaign is equivalent to one client. Campaigns are the foundation of the different features, products, and apps in SEOReseller.com. You can buy products for a campaign, subscribe a Campaign to an app, or collect new leads/calls for a Campaign. Products that you buy for your campaigns are called Projects. A Project is a product deployed to a campaign and would then be fulfilled by the SEOReseller.com team. It contains Milestones that contain all the Tasks deliverable for that project within the time duration of the project, which we call a Cycle. For recurring products, each successive month of a campaign with the same product will create a different Milestone with another set of tasks for that month. We execute all deliverables under either one of two service cycles: the 1st or 15th Cycle.